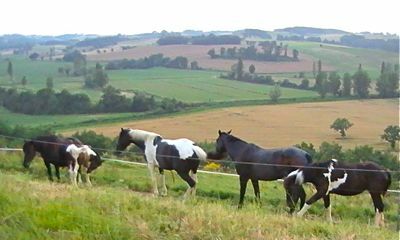 Our personal experience of breeding horses in the herd situation is not extensive because we are not in this business, but the experiences we have had, and those of many of our breeder friends, have led us to the same conclusion: horses are herd animals and when they are given the responsibility to behave as they would in a wild situation, it is rare for them not to do so. 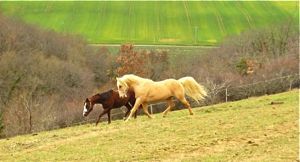 Examples of horse breeders who use a natural environment are our neighbour Susan Pfeifer at Rambos (this photo shows her Quarter-horse stallion running free), and Dogwood Sports Horses in the US - this article gives a beautiful account of a mare and stallion's interaction in a herd setting. 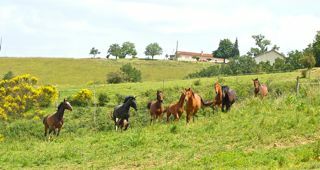 There are many differing opinions of how to manage breeding horses, and it is true that reproducing the scenario of a wild band in most domestic situations is not always possible. 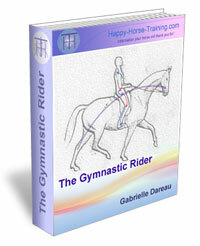 Often the reasons for this are based on a lack of understanding however, rather than what is actually best for the horses. 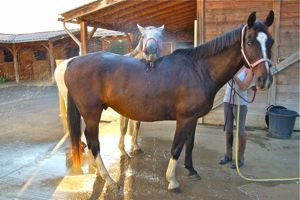 Horses know how to look after each other better than we do as long as their instincts have not been too badly disturbed. 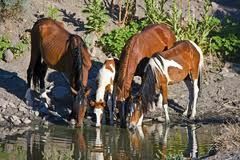 These photos show wild breeding horse bands, drinking and grooming and just being together. 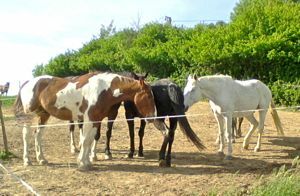 The photo below is our family herd. 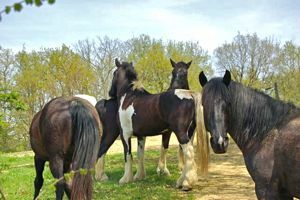 The fact that they may not be a typical horse herd is immaterial, they are being as horses should be allowed to be, secure in each others company and enjoying their lives. 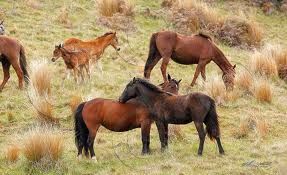 If we interfere and separate the older youngster in a forced weaning process, no matter how 'well arranged' the mare will be upset by the weaning experience, which will influence her unborn foal, and she will be on her own raising her baby. 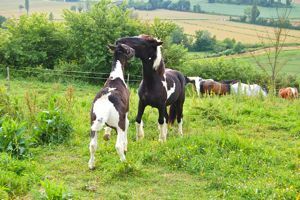 We may worry that she becomes too drained physically by a foal at foot while she is pregnant, but if she is well fed and looked after, the emotional damage from the separation will have much greater consequences for her health. 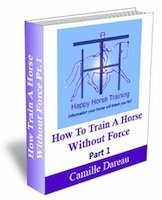 She will wean her present foal in her own way when her time has come and there will be no unnatural traumatisation which affects the youngsters outlook and relationship with people for the rest of their lives. 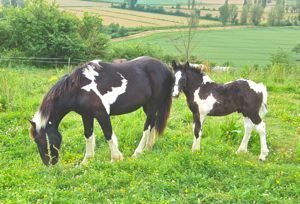 The following photos show a foal who was born with us, the year after his older sister who we had taken on the year before along with her mother. 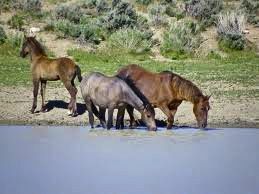 Instead of separating the yearling from her mother and newborn foal, we left them together, and a natural weaning process took place as a result. Not only was this totally un-traumatic for the yealing, but it meant that she was there to look after her younger brother, giving their mother a well-needed rest. Interestingly, Totale, the older sister who was weaned naturally, has now grown into an incredibly confident adult, never worried about being taken from the herd and worked on her own. 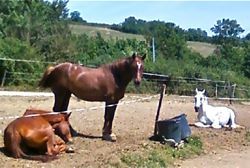 Unfortunately, although he did stay with his mother until he was a year old, we were unable to wean her younger brother naturally because we had to give the mare back to her owner. 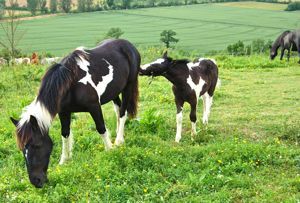 He has grown up to be a much more nervous character, and is much less happy to leave the herd than his sister. 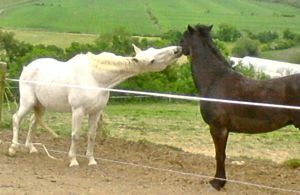 There is undoubtedly an element of innate temperament in this difference, but Uno's natural timidity only made the forced separation from his mother all the more difficult for him. 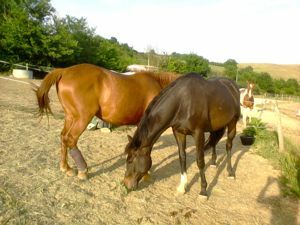 Our two warmblood youngsters who we bought from the stud at 6 months of age, and whose weaning we obviously had no control over, have such a naturally confident temperament that they handled this event and subsequent change of home without excessive negative consequences, although their subsequent integration into our main herd will undoubtedly have gone a long way to healing any wounds from this separation. 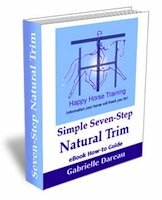 If breeding horses was not such a commercial enterprise in many cases, we could easily avoid stress and trauma that often has a lifelong influence on horses, simply by allowing things to proceed more naturally, and in their own time.